Those of us who love Japan and have lived here for a while are unfortunately used to hearing – and worrying – about natural disasters. This year alone much of Japan has had to put up with intense heat; there has been widespread flooding in Western areas; a few destructive typhoons have left messy trails… and of course, there’s earthquakes (地震 jishin). There’s no two ways about it - earthquakes are part of life in Japan. While Japan is certainly at the forefront of trying to understand and predict them, there are still a lot of unknowns and unfortunately predictions remain more like educated guesses than meaningful forecasts that can be acted upon. The bottom line is that earthquakes are expected. There are earthquakes every single day of the year somewhere in Japan. Luckily most of these are are barely noticeable and even moderately strong tremors are reported on but are often quickly forgotten. And while some regions are much more prone to earthquakes than others due to being on plate borders or known active fault lines, they literally can happen without warning anywhere in the country - numerous recent significant earthquakes have occurred in places where they weren’t really expected. The strength of earthquakes is usually talked about in terms of Magnitude. The Magnitude measurement describes the actual energy that is released by the earthquake, but how that translates to the intensity of the ‘shaking’ that us humans on the ground experience in different locations depends on various factors such as how deep the earthquake occurs and distance from the epicentre. Japan has another – and arguably much more meaningful - way of measuring earthquakes called the ‘seismic intensity scale’ (or 震度 ‘Shindo’ in Japanese). Shindo basically translates as ‘degree of shaking’ and the scale describing the degree of shaking at various points on the ground. With well over 600 meters measuring this seismic intensity throughout Japan, pretty much the whole country is covered and almost immediately after a quake happens this information is automatically relayed on TV broadcasts and online. The Shindo scale has 10 levels and goes from Shindo 0 to Shindo 7. Shindo 0 is basically only detectable by specialist equipment and Shindo 1 is a minor tremor that many people might not even notice. From there it goes from 2, 3, 4, 5 Lower, 5 Upper, 6 Lower, 6 Upper… and then 7. Shindo 7 is major shaking and will cause considerable damage. When a destructive earthquake occurs, it is often older buildings that are most affected. With current strict earthquake-proofing building codes, modern buildings are built to withstand strong quakes. And not all earthquakes are the same when considering potential building damage – it’s not just the actual strength of shaking, but the type of shaking. At just after 3am on Thursday 6th September, people on the northern island of Hokkaido (and well beyond) were rudely woken by a particularly strong earthquake measuring 6.6 on the Magnitude scale. The epicentre of this quake – the point on the earth surface about 40km directly vertically above the point where the seismic rupture began – was in Atsuma town. 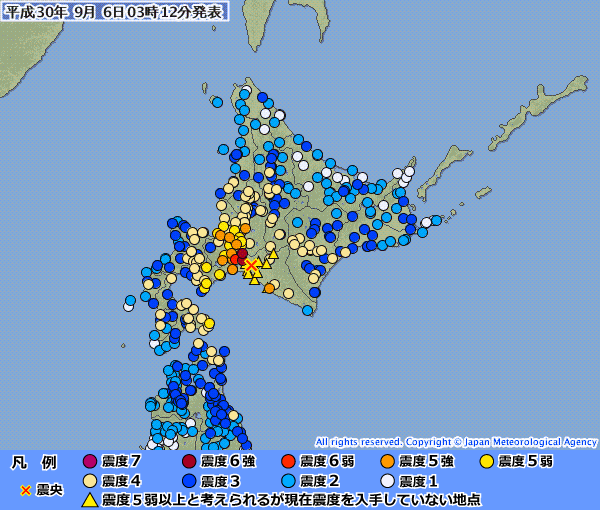 The strongest shaking was recorded in Atsuma town which is about 80km to the south east of Sapporo city. Shindo 7 was recorded there and this is the first time that such an intensity has been recorded in Hokkaido and only the sixth time that Shindo 7 has been recorded in Japan since 1949. (For those interested, the previous times have been the Kobe quake in 1995, the Chuetsu earthquake in Niigata in 2004, the Tohoku quake in 2011 and twice in the Kumamoto quake in 2016). Shin Chitose Airport, located not too far to the north-west of Atsuma town, registered a Shindo 6; and many other places within a wide radius on the island experienced Shindo 5 and 6. 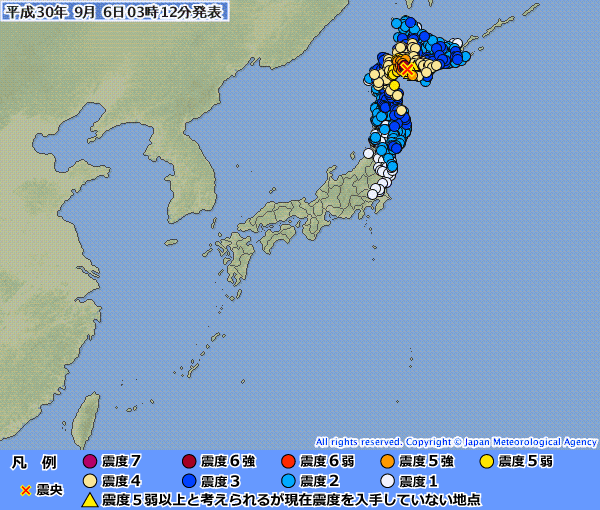 A very wide region beyond Hokkaido was affected with most of the northern Tohoku region of Honshu island also experiencing varying degrees of shaking. Significant earthquakes in Japan get their own name and this one was quickly named 北海道胆振東部地震. The Hokkaido Iburi Tobu Earthquake. In the immediate aftermath of the initial quake, electricity throughout Hokkaido was cut due to damage at the major power plant in Atsuma. All public transport was shut down with hospitals needing to rely on backup power. TV reports started showing various dramatic landslides that had consumed roads and houses, as well as various cases of soil liquefaction where the ground just seems to collapse due to the shaking of saturated or partially saturated soil. The heavy rainfall just before the earthquake surely did not help. At the time of writing, as a direct result of the earthquake, 41 deaths have been confirmed with 660 injured and thousands remaining in evacuation centres. Our thoughts are with everyone impacted. What about the ski resorts? This being SnowJapan, no doubt some people reading this will inevitably be asking --- how are the ski resorts? Over the last few days we have been speaking with various people based in various popular ski resort areas in Hokkaido and it seems that generally that there is no real damage to report. The popular Niseko, Rusutsu and Furano regions all experienced Shindo 4 on the intensity scale. That translates to fairly strong shaking and no doubt a rather scary experience, but it did not result in any infrastructure damage. They endured an electricity blackout of around 24 hours, though gas and water remained available. The island-wide blackout and ongoing disruption however has meant that supermarket and convenience store shelves have been bare in the immediate aftermath and everyday items such as bread and daily products have been in short supply, as has petrol. The farming and fishing industries have also taken something of a battering. Apparently, Hokkaido supplies about half of Japan’s milk – but with the power cut the milk could not be treated and so a large amount has gone to waste. We very well might expect some expensive vegetables this autumn too. It was thought that rolling blackouts might be required this week, but it doesn’t look like that is going to be required. However, the authorities are still urging people and businesses to try and use (20%) less electricity than usual for the moment as they work to get supply back to normal. Today we have heard that apparently power might not be fully restored until November, and so people are urged to use it with care. (Which is probably not a bad thing even in totally normal times). There are also things like the Hirafu Summer Gondola not running at the moment in order to preserve power... though in another update just this afternoon, they have announced that they will be resuming operations on weekends this month (starting on Saturday). But in the big picture, these are minor issues, and apart from the inconveniences and short-term disruptions things are generally getting almost back to normal in all but the worst affected regions in that region to the south-east of Sapporo city. As for the smaller ski hills in central Hokkaido, we will be checking and making notes of any specific news when we make updates to the individual ski hill information pages within SnowJapan. That work is being done over the coming three months… so keep an eye on the ski resort pages of the site. Japan and its people are very resilient. Forgive the generalisation, but the way that society goes about recovery after events like this shows some truly admirable qualities – generosity, stoicism, endurance, determination... (You would have to try very hard to try and find any reports of negative and unsociable behaviour and people trying to take advantage). For those of you potentially worried about your winter trip to Hokkaido... don’t be. There really is no reason why this event should affect a planned holiday on Hokkaido this coming winter. Everything is still there, and the ski resorts are not damaged. Indeed, by the time the ski season begins starting from late November, visitors to Hokkaido will likely not be aware that any of this happened. And remember that as previously mentioned, earthquakes can happen anywhere and at any time in Japan - so there is no reason to consider avoiding Hokkaido for that reason. (Also remember that SnowJapan is not here to sell you a holiday in Hokkaido or any other region... we are here to provide honest information). It will take a while for people affected to recover; and for some people there are life-changing consequences which mean that of course it will not be forgotten. But one thing is for sure – the locals will be very happy to see you and they will appreciate your visit. Japan has really taken something of a beating this year by a run of natural disasters and extreme weather. With the flooding, typhoons and unusually hot conditions, everyone is thinking that we have endured more than our fair share. Obviously nature doesn’t work that way, but it would be nice to think that as some sort of compensation we will get treated to a classic winter season. Japan usually delivers in terms of snow, so we're pretty confident on that score! SnowJapan will be here daily to bring you the true unfolding story of the entire season. In the meantime, best wishes to everyone dealing with the current situation up in Hokkaido. Many thanks to the friends and colleagues who helped us put this article together. We believe that all the information here is correct at the time of writing. If you believe there are any mistakes or feel there is more important information that we can share, please do let us know at editor@snowjapan.com and we will certainly consider updating this article. Thank you.